Lois Pryce was working at the BBC in London, firmly set on the career track. But unbeknownst to her coworkers, Lois was leading a parallel life as well, that of a biker babe with an overwhelming case of wanderlust, one that couldnt be satisfied by a weekend holiday. Her days in a cubicle were numbered, and it wasnt long before she was back on her bike and looking for adventure. Armed only with the Spanish words for caution and cheese, Lois set off to conquer America---both Americas, actually. Starting in Alaska and working her way down the Pacific Coast, she rode through snow, desert, and everything in between to reach the southernmost tip of Argentina. Lois tackled every type of fellow biker imaginable and endured everything the continents could throw at her with quick thinking and a vibrant sense of humor. 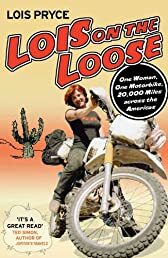 Whether bribing her way through Central American borders, spending the night in a Mexican brothel, or crashing her bike in Patagonia, Loiss bright, funny travelogue will charm anyone who longs for adventure and a stretch of the open road.